Owen Jenkins survived some heart-stopping moments to collect his first winner’s trophy on the Cuestars under-21 bronze tour. It was gone 9pm when the 10-year-old from Havant potted match-ball in the final at Salisbury Snooker Club – writes Tim Dunkley. Jenkins slotted a tricky brown into a middle pocket to leave the highly-rated Dylan Smith, from Tunbridge Wells, needing snookers in the third-frame decider. The latest budding star to graduate from the junior leagues at Waterlooville Sports Bar admitted it was a hard-fought battle. Jenkins said: ‘He made a good comeback in the second frame. I thought I could still win but I knew it would be harder than the first frame. Jenkins had lost to Cuestars debutant Smith in the group stages of the Attic Life-sponsored event. The youngster also had an epic semi-final battle which ended when his opponent, Adam Cowdroy, went in-off the final black in the deciding frame. A total of 10 players based at Waterlooville Sports Bar made the trip to Wiltshire. Thomas Sharp (Copnor), appearing in his first bronze semi-final, lost 2-0 to Smith. Lewis Wilson lost a three-way play-off after being drawn in the same group as both finalists. England international Jamie Wilson was undefeated in his Gold group but went down 2-0 to last season’s rankings winner, Bradley Cowdroy, in the last-eight. Harry Wilson and Samuel Laxton both qualified for the knockout on their Silver debuts but lost in the last-eight. Wilson, who won his group, went out 2-1 to Keegan Reed. Laxton was beaten 2-1 by Shane Kearns. Dean Russell, Zak Truscott and Callum White made group-stage exits. Newly-promoted gold tour player Chloe White lost in the plate final. The second legs of 10 are at Waterlooville Sports Bar on Sunday, October 7. Meanwhile, defending champion Jayden Brookes, eight-year-old Keira Hiscock and newcomer Tom Poynter all won five matches in the top group of the new Junior Pool League at Waterlooville Sports Bar. Jayden Hickley won the second group. 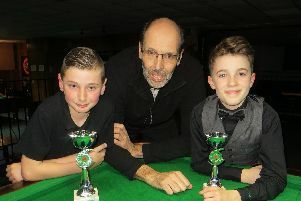 Truscott extended his lead over Jenkins to six points in the Monday Junior Snooker League but he was overtaken by Laxton in the Wednesday league. Sessions are held for under-19s from 4.30-6.30pm every Monday and Wednesday and junior pool sessions from 4.30-6.30pm every Thursday.